The Best of Birnam Wood! Step inside to a wonderful lock-and-leave home in the gated golf community of Birnam Wood. This custom built residence is perfectly proportioned with lofty ceilings and a thoughtful floor plan that captures Montecito’s gorgeous natural light. The formal living room offers an elegant welcome to guests and is ideal for afternoon tea or after dinner conversations. Built-in shelves are perfect for hosting books, decor, and photos of loved ones. A beautiful stone fireplace brings a warm glow to cool nights and anchors the room with timeless elegance. An expansive great room opens to the terrace and fully embodies the best of Montecito’s indoor/outdoor lifestyle. Overlooking the verdant grounds of the fairway and extending into the dining area and kitchen, this space is ideal for how we live today yet showcases some beautiful, traditional elements. Custom built-ins embrace both sides of a gas fireplace, and rustic beams crown the vaulted ceiling. Clearstory windows fill the room with natural light and add a thoughtful architectural element to the space. The beautiful eat-in kitchen extends to the dining area and looks to the lush fairway. Beamed ceilings and custom cabinetry offer architectural details, and professional appliances support culinary adventures of all kinds. The spacious main floor master suite opens to a private courtyard and fountain that overlooks the Santa Ynez mountains. Vaulted ceilings and clearstory windows give the room a lofty feeling, and dual closets offer extensive storage. A peaceful respite within the home, this master suite is a true sanctuary. Adjacent to the master, a handsome office is perfect for catching up on emails, reviewing reports, and staying organized. With built-in storage and large enough to accommodate dual desks, this workspace offers abundant space and is perfect for those who like to work in tandem. A spacious en-suite bedroom features vaulted ceilings, a charming window seat, and beautiful bath with a soaking tub. Conveniently located near a private entrance, guests and loved ones will appreciate the gorgeous accommodations and stunning views. Upstairs, a large bonus room offers endless possibilities. Little visitors? Perfect for bunk beds and play space. Have you always wanted a sewing studio or place to practice guitar? The bonus room has great privacy for projects and gear. Perhaps you simply are looking for additional storage. This area is great for luggage, seasonal decor, and boxes filled with precious memories. 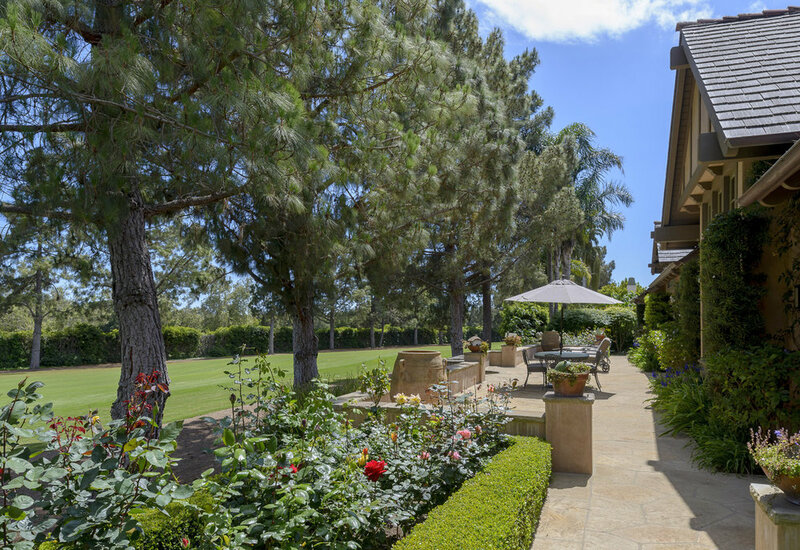 The back terrace spans the entire length of the home and overlooks the lush course grounds. Ideal for entertaining, outdoor dining, or simply enjoying the peace and quiet of the surroundings, the expansive terrace is a natural extension of the home. For more private moments, an intimate outdoor fireplace provides a gorgeous backdrop for quiet evenings under the stars. Birnam Wood’s convenient lifestyle is known for single level living, an award-winning golf course, delicious dining, beautiful views, and an active social community. 2129 Forge perfectly captures the essence of Montecito’s beloved gated community and is a wonderful pairing of great architecture and a fabulous location.